At clean energy conferences, participants like to mention how someday we’ll all have electric cars parked in our garages that can sell power back to the grid during peak times or power our homes during outages. These people talk about the concept, known as vehicle-to-grid (V2G), as if it’s a reality just around the corner. In the U.S., it’s now only a reality for one small fleet of electric vehicles operated by the eV2g project, an effort of NRG Energy and the University of Delaware. The joint partnership recently announced it is successfully bidding into ancillary services markets in PJM Interconnection after about two years of pilots. The step forward is important, but it will be a long time before every garage has the potential to play in energy markets. The cars provide frequency regulation, which is used to balance supply and demand on the grid within seconds, and will become increasingly necessary as intermittent renewable energy comes onto the grid. But grid operators and automakers are still working out exactly how to provide services without limiting the life or performance of the car’s battery. “We wanted to look at the fleet as an individual resource,” said Michael Kormos, SVP of operations at PJM. To do that, it took innovation by PJM and the eV2g project, which is spearheaded by Willett Kempton, a director of the Center for Carbon-Free Power Integration at the University of Delaware. PJM has to change the rules for the size of an asset that could be bid into the market, decreasing it from 500 kilowatts to 100 kilowatts. The fleet of about a dozen vehicles aggregates to just over 100 kilowatts, according to Kormos. Another change came from the signal itself. “One of our biggest challenges was the regulation signal,” Kormos said of piloting electric vehicles and other batteries. To account for the fact that batteries respond better to fast fluctuations, PJM split its regulation signal into two for different types of resources. PJM had measured the regulation in minutes, but batteries respond within seconds. The faster response also garners higher payments, because it means the grid operator has to carry less load. On the vehicle side, Kempton has been working on software that can choose whether to use all the cars or some of them when they receive the signal. One car might need to be fully charged within the next hour, so it isn’t a contender, while another car might be plugged in for the next twelve hours and can provide a larger share of the power needed. “This demonstrates that EVs can provide both mobility and stationary power while helping making the grid more resilient and ultimately generating revenue for electric vehicle owners,” Denise Wilson, executive vice president of NRG Energy, said in a statement. Of course, you’d have to own a fleet of electric vehicles to make this work. And, you’d have to live in PJM’s territory, which serves a wide swath of the mid-Atlantic. Kormos said the project has a lot of interest from different manufacturers, but added that NRG and the University of Delaware are still far out in front with the technology and execution. 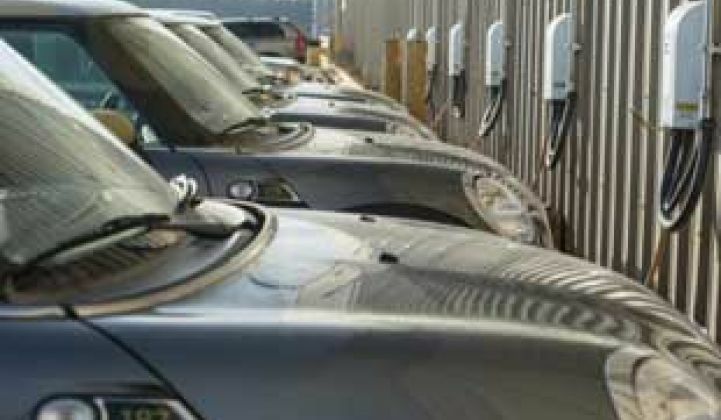 A more realistic option in the short(er) term is for electric vehicles to use variable charging to respond to peak energy demand rather than actually playing in the ancillary services market. Most of the interest is coming from fleets, including everything from school buses to mail delivery trucks. The rule change also allows for smaller assets beyond just batteries on four wheels. Demand response aggregators could also bid in HVAC equipment or variable-speed pumps that add up to at least 100 kilowatts.